The last big weekend of the summer is behind us and the kids are back to school. This doesn’t mean we have to cover up the grill and forget about it. Instead, we should remember that grilling results in quick and easy dinners, which are perfect for that back-to-school grind. But just because you’re using the grill doesn’t mean you have to stick with the usual Steak, Potato, Veg or Chicken, Potato, Veg. There are so many different things to make if you let your creativity flow. Grilled Fajitas are always a success around my house. This is probably because everyone gets to choose what goes into their own tortilla. When dinner assembly happens at the table there seems to be less complaining from the kids about what they’re being forced to eat. Sometimes there’s even pride and excitement at having picked things for themselves. One of the best things about making fajitas is that there’s a never-ending list of possible toppings that you can add. 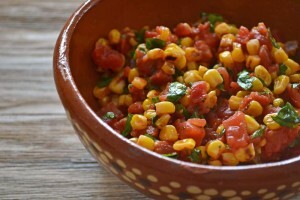 My new favorite is this Toasted Corn Salsa that I originally came up with as a topping for Tostados. For this recipe, instead of toasting defrosted corn in a skillet, you could grill whole cobs of corn and then slice off the blackened kernels. Oh, and don’t forget, just as with the turkey burgers, there’s no reason that you have to stay traditional. I mean, just because there’s a tortilla involved doesn’t mean you have to use Mexican flavors. Why not try grilled chicken served alongside slices of brie, sun dried tomatoes and arugula? 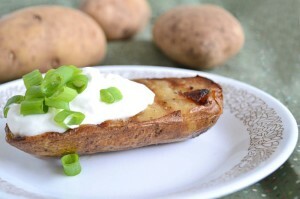 (I think I just found our dinner for tonight!). Quick pasta recipes are also great for weeknights. Why not use the grill for these as well? Wait. I don’t want you to grill the noodles. Those get boiled as usual in a pot on the stove (but just before draining, rescue about 1 cup of the hot starchy water to help with the sauce later on). This pasta is a really good example of how easy it is to come up with grilled weeknight dinners. See, all you need to do is think about your normal weeknight dinners and then put a grilled spin on them. Get creative, have fun and use the grill to make simple dinners that will get you and your family into the back-to-school swing of things again.